Capturing the European aesthetic, our uPVC French casement windows are sure to be a charming addition to any home. Combining premium grade materials with an innovative uPVC profile, these windows are sure to be a worthy investment throughout. 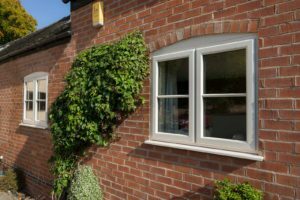 Exuding an incredibly versatile appearance, uPVC French casement windows can be easily installed into both modern and traditional homes. uPVC French casement windows feature a unique ‘flying mullion’ feature that removes any static features upon opening. This allows you to enjoy the simultaneous benefit of unobstructed views and unrestricted ventilation. This function also allows them to be effectively used as a fire escape in all habitable rooms. The innovative Traditional 2500 uPVC profile from Deceuninck means that our uPVC French casement windows do not falter on performance, despite their enhanced functionality. 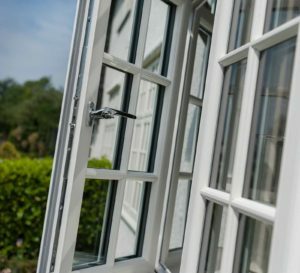 To ensure ease of use and sustainability, all of our French casement windows are incredibly low maintenance and 100% recyclable. This means they consist of an economically friendly profile that won’t rot, warp or discolour over the years. 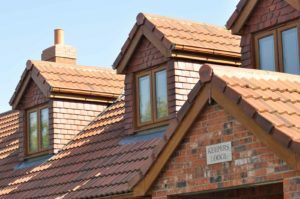 Thermal inserts are installed into the intelligently designed profile to ensure outstanding degrees of thermal efficiency for your home. This allows our uPVC French casement windows to achieve A* standards of energy efficiency, as appointed by CERTASS. 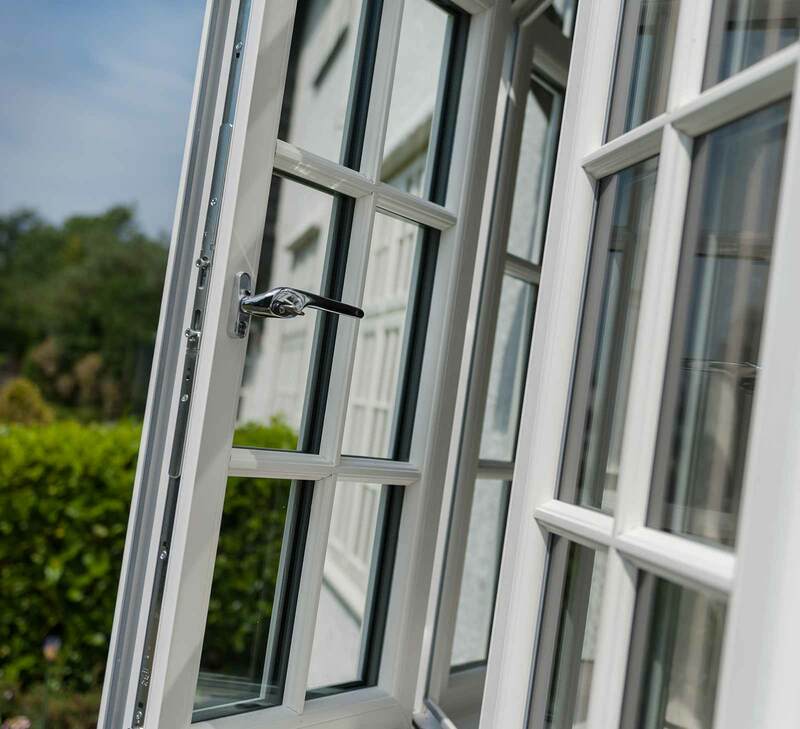 We use patented Glass Fibre Linktrusion to enhance home security, allowing our uPVC French casement windows to achieve Secured by Design standards of security. This police preferred standards guarantees peace of mind. The Traditional 2500 profile from Deceuninck is meticulously design and stringently tested to ensure if offers only the highest standards of quality available. This means you’ll be getting the very best for your home at a highly competitive and cost-effective price. We also offer a high quality range of uPVC French casement windows from Synseal, which effortlessly capture the beautifully cultured appearance whilst still offering unbeatable standards of thermal efficiency, security and durability across the board. Consisting of a profile that achieves ‘A’ rated standards of thermal efficiency and Secured by Design standards of security, it’s never been easier to secure yourself outstanding quality. Especially when it’s accompanied with a 10 year guarantee. We offer a range of 18 high quality colours for you choose from, allowing you to decorate your uPVC French casement windows in a colour that is perfectly suited to your tastes and preferences. Standing as the number one choice of colours, there simply is no better selection. 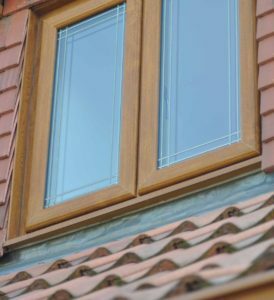 All windows are accompanied with matching trims and cills to ensure a beautiful finish. Visit our online quoting engine today to get a free, instant and highly competitive uPVC French casement window quote. We strive to offer you the very best products at the very best prices. Alternatively, our online contact form allows you to speak to a member of our friendly team, who will be more than happy to answer any questions you may have.